TVs with sleeker and slimmer profiles are the most preferred in the modern society. Such a profile provides more options in the placement of a flat-panel TV on a wall. You’ll have to agree with me that virtually all flat-screens come with a pedestal stand. However, mounting your flat-screen on the wall proves to be a more stylish and space-efficient installation. And to achieve that, you need to get yourself the right TV wall mount bracket. Wall mount brackets come in different types depending on the range of motion. This makes it possible to fit TVs of different styles and sizes. Some of the main types of TV wall brackets include low-profile mount, tilting mount and full-motion mount. Among these, full-motion mounts provide the most comfortable view angle ideal open space areas. Low-profile and tilting mounts make the perfect option for small rooms. Some considerations, such as loading capacity, TV size and VESA compliance need to be taken into account in order to choose the right wall mount for your TV. 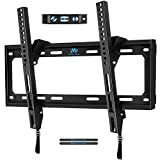 Below are the best TV wall mount brackets you might want to consider. If you want a TV mount for open air living spaces, this bracket is the right option for you. It comes in a full-motion articulating design that lets you tilt and swivel your TV to get a perfect viewing spot. The tilt is done up to 15 degrees with 130 degrees of swivel. 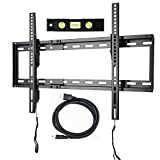 This low-profile mount positions the TV 2.6 inches from the wall and allows for a maximum extension of 16 inches. The mount fits 37 to 70-inch flat screen TVs and has a weight limit of 132 pounds though it’s tested to hold 4 times the weight. 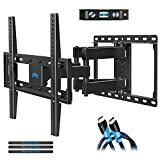 This TV wall mount bracket takes adjustable motion a notch higher. It tilts 15 degrees vertically and swivel 180 degrees horizontally. This provides a great viewing angle from any position in the room. 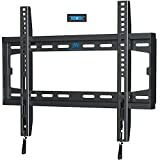 The mount extends 20 inches from the wall and fits TVs 26 to 50 inches in size. The durable steel construction provides long-lasting hold. This mount has a weight limit of 60 pounds and mounts best on wood stud and concrete walls. In case you’re planning to mount your TV above a fireplace or in boardrooms, this bracket will suffice. It sports a tilting design adjustable to a maximum of 15 degrees. the TV sits 1.5 inches from the wall at zero tilt. The mount is made of heavy steel to provide a sturdy support for TVs up to 100 pounds. TV sizes recommended for this wall mount bracket are from 26 to 55 inches. The mount comes with 6 feet high speed HDMI cable. This wall mount comes in a low profile design that lets the TV sit 1.3 inches from the wall. However, it offers some degree of tilt and rotation (3 degrees) to improve viewing and minimize glare. The bracket mounts best on wooden studs placed 16 or 24 inches apart. It fits TV sizes of 20 to 75 inches and supports up to 165 pounds. 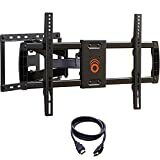 This TV wall mount bracket comes with high speed HDMI cable and magnetic bubble level. This is a versatile wall mount bracket providing the convenience of both a low profile and tilt design. The low profile creates a stylish appearance while a 15 degree tilt comes in handy to reduce glare. The tilt motion is both on the forward and backward direction. 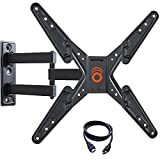 This mount fits 23 to 75 inch TVs and supports up to 165 pounds. The frame comes strong in a dual steel construction for maximum durability. A bubble level is included to ensure that the bracket sits leveled on the wall during installation. This mount comes unique in a dual arms design. It’s a full-motion articulating mount allowing for adjustments both on the vertical and horizontal. The mount retracts 3 inches to the wall to save space and extends to a maximum of 15.2 inches from the wall. It sports a 15 degree tilt, 45 degree swivel and 3 degree rotation for optimized viewing flexibility. The frame is made oh heavy duty steel finished with a powder coated for improved structural strength. 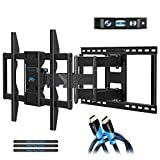 Such a construction lets it support up to 99 pounds and fits TVs from 26 to 55 inches. Ultra slim TVs look great on this low profile wall mount. It provides a 1-inch clearance from the wall to provide a flush stylish look. The steel frame is powder coated to resist scratches and add something extra to its structural strength. It feels sturdy enough to support up to 100 pounds. 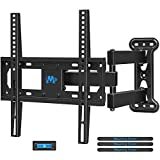 This TV wall mount bracket installs on 8 and 16 inch wall studs. It fits all TVs in the size of 26 to 55 inches. Viewing your flat screen TV becomes more comfortable with this full motion articulating mount. The bracket comes in a durable steel frame designed to take some beating. It supports up to 60 pounds but has a tested capacity that’s 4 times that. The mount sits 3.2 inches from the wall in a retracted position and extends 19 inches out. You get a multi-view angle provided by a 15 degree tilt, 90 degree swivel and 3 degree rotation. The mount fits TV sizes in the range of 26 to 55 inches. This full motion bracket provides stable and smooth movement to let you get an ideal viewing angle. It comes in a smart design featuring a robotic welded technology with a loading capacity of 132 pounds. The mount extends 18.5 inches from and sits 2.5 inches to the wall in a retracted position. It installs on studs spaced at 24 or 16 inches. The bracket tilts 15 degrees, swivels 45 degrees and rotates through 3 degrees. Dual spring-loaded handles come in handy to make tilting angle adjustments much easier. 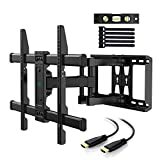 This mount bracket is for TVs with a size of 42 to 70 inches. This bracket has a full motion universal design that fits TVs in the size range of 37 to 70 inches. The frame sits sturdy to provide a loading capacity of 100 pounds. The mount holds your TV 2.8 inches from the wall and extends it 16 inches outward. It tilts within 10 degrees, swivels up to 180 degrees and rotates within 6 degrees. The bracket installs on wall studs spaced at 16 inches. Cable management comes in the form of five cable ties.